A gaggle of high school kids gathers outside the Shih Yu Lang Central YMCA'S new location on Golden Gate between Larkin and Hyde. They slouch, slink and be-bop simultaneously as only teenagers can. They could be your kids. They could be my kids. They look and sound like average adolescents. They laugh a little too loud. Some wear their skirts a little too high or their pants a little too low. Some sport piercings in all the wrong places and hair colors Mother Nature never dreamed of. Typical teens except that most of these kids have to make tough choices like whether to spend what little money they may have on food or bus fare to get home if they even have a home. These kids belong to the Shih Yu Lang Central YMCA's Tenderloin Youth Development Program. (TYDP). This comprehensive after school program costs over $1,000/year per youth. Of that cost, the attending youths pay an annual membership fee of only $35 which is reduced or waived if necessary. TYDP Program Director Darien Mitchell reports that approximately 80% of the attendees need fee reductions or waivers. Thanks to Food Runners, once a week these kids can choose to use their money for bus fare instead of food. Every Tuesday afternoon, long-time Food Runners volunteers John and Marcia T. include a food run on their weekly jaunt into town from their home in Half Moon Bay. After their standing appointment on Nob Hill, John and Marcia scoot over to Le Colonial where they pick up a tray of food prepared by Chef Joe Villanueva especially for donation to Food Runners. Every Tuesday afternoon, rotating Food Runners volunteers stop by Cathedral School for Boys to pick up excess food generated by school lunches. Perfect for the teens at TYDP! Every Tuesday afternoon, the study room at 387 Golden Gate is quieter. Every Tuesday afternoon, the growl of rumbling stomachs is replaced by the sound of pages turning in books and the click of fingernails on keyboards. On Tuesdays, tougher math problems get solved, harder words get spelled correctly and more homework gets finished. Every Tuesday afternoon, maybe, just maybe some of these kids inch a little closer to success because they can concentrate on things other than hunger. Other youth programs receiving regular donations from Food Runners include 7 Teepees Youth Program, Larkin Street Youth Services, At the Crossroads, Vietnamese Youth Development Center, Back on Track Tutoring, Oasis for Girls and Booker T. Washington Community Center. Regular donors supplying the food that Food Runners delivers to these programs include: St. Ignatius College Prep, Beast Editorial, TPG Captial, Escape from New York Pizza, Amici's East Coast Pizzeria, Justin TV, Miette Cakes on Chestnut and Acre Gourmet from both Town School and Cathedral School for Boys. 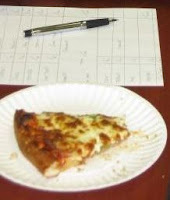 Food Runners picked up and delivered 115,625 pounds of food during the month of January. 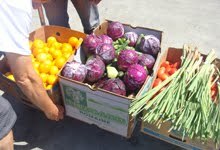 Many thanks to Rick Hildreth of the Noe Valley Farmer's Market. 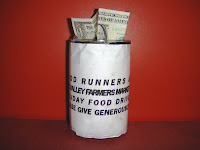 During the month of December, Rick placed home-cobbled, "holiday food drive" donation jars in strategic locations around the market encouraging shoppers to make contributions to Food Runners. The total collected in small bills and change was $303.87! Do you like cupcakes? So do Food Runners recipients. Especially the seniors. Kara's Cupcakes donated over 120,000 cupcakes in 2009! Food Runners volunteers love picking up at Kara's cute shop in the Marina. They love it even more when they are greeted by happy faces at places like Aquatic Park Senior Center, Telegraph Hill Neighborhood Center, Curry Senior Center and more. Do you know what your local market is doing with their slightly damaged produce, sandiwches or other foods? Tell them about Food Runners. With the tragedy in Haiti fresh in our minds, it is more important than ever to stop hunger and alleviate in every way we can. Food Runners is just a phone call away. Encourage your local vendors to call today. 415-929-1866. Don't forget to mention that Food Runners is safe, it's legal and it's free.